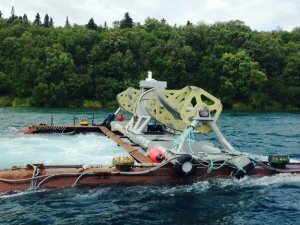 Tidal energy company Ocean Renewable Power Company (ORPC) has deployed its RivGen power system in the Kvichak River at the remote river village of Igiugig, Alaska. The system is providing power to the local microgrid, significantly decreasing the community's diesel fuel use. Equipped with ORPC’s latest technological advancements, the 25-kilowatt RivGen Power System is designed to reduce and stabilize the cost of power in remote or "islanded" communities located near rivers and tidal estuaries. The device, which generates electricity from the river’s current, is submerged near the west bank of the river between Fish and Game and Fly Islands approximately a half mile from the head of the river. The University of Washington, a partner in the Northwest National Marine Renewable Energy Center, is on-site in Igiugig as part of a project funded by the US Department of Energy to develop advanced control systems for tidal energy devices to improve performance their performance in turbulent current conditions.ORPC has invested over $3.2 million in Alaska since 2009.